This simple but effective striped design is ultra fashionable and a must have for 2015. Choose from a selection of colours and sizes, each rug is thick & heavy and is made from 100% pure wool. 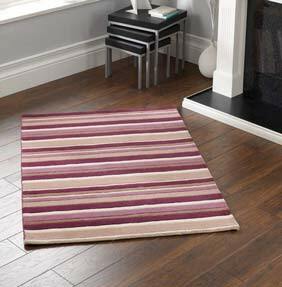 Our Stripes rug collection is handmade in India to a high standard, this range is contemporary coloured and should blend well with striped wallpaper and soft furnishings. Made in 3 standard sizes and 4 different colours.